Two of the three largest asteroids, Ceres and Vesta, are in opposition to the Sun this week, along with the planet Mars. This chart shows their positions on the night of April 9, and their daily positions over the next two weeks. This week most skywatchers will have their eyes on the planet Mars, which reached opposition with the sun on April 8, but will be unaware that two other important solar system bodies also came into opposition the next week. Two of the three largest asteroids, Vesta and Ceres, reached opposition on Sunday, April 13, and Tuesday, April 15, respectively. The third, Pallas, was in opposition on Feb. 22. All three asteroids, along with a fourth, Juno, were discovered in a remarkable seven-year period beginning on the first day of the 19th century, Jan. 1, 1801. Although Vesta is about half the size of Ceres, it appears brighter in our sky, because its surface is whiter than that of Ceres, reflecting a lot more of the sun's light. 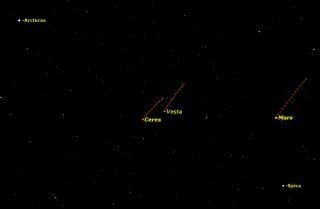 At its brightest, Vesta is just barely visible with the naked eye, but is much more easily spotted with binoculars. At the beginning of April it was magnitude 5.8. Ceres was only magnitude 7.0, and so binoculars will be essential. Both will appear as star-like points of light; that'swhy they are called "asteroids." At the beginning of April, both asteroids were located almost halfway between the first magnitude stars Arcturus and Spica. These stars can be spotted using the arc of the handle of the Big Dipper. Follow the arc away from the Dipper's bowl, "arc to Arcturus and speed on to Spica." Ceres is nearly three times farther than Mars, at 1.644 AU, and moves even more slowly. Because an asteroid looks just like a star, the only way to be sure you're looking at the right thing is to make a sketch of the star field on two different nights. The "star" that moves will be the asteroid. This article was provided to SPACE.com by Simulation Curriculum, the leader in space science curriculum solutions and the makers of Starry Nightand SkySafari. Follow Starry Night on Twitter @StarryNightEdu. Follow us @Spacedotcom, Facebookand Google+. Original article on Space.com.